The Rockets have provided many fantasy stars over the past three years. 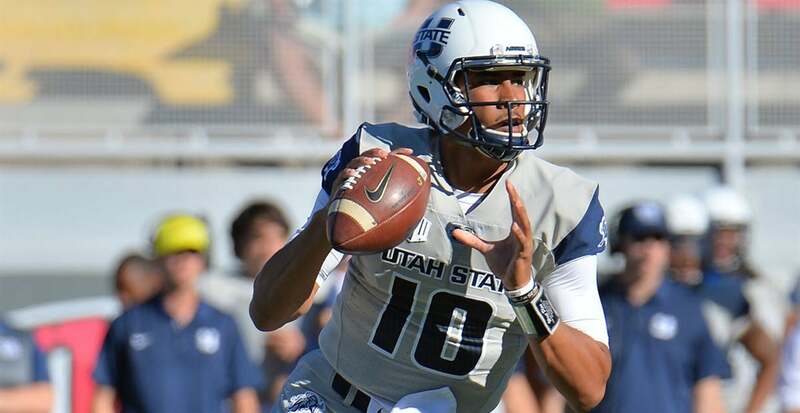 Quarterback Mitchell Guadagni is the next man up and deserves a long look on CFF rosters. He commands one of the best wide receiver corps—Diontae Johnson, Cody Thompson and Jon’Vea Johnson—in college football. Accounting for six of the team’s nine touchdowns on Saturday, he led Toledo to a 63-44 shootout victory against Nevada. Over the first three games of the season, the Junior has passed for 698 yards, tossed nine touchdowns, rushed for 198 yards and scored twice on the ground. Guadagni, 6-foot-2 and 200 pounds, remains available on 90% of waiver wires and should be scooped up this week. At 6-foot-4 and 225 pounds, Jordan Love owns a strong arm and is an accurate deep thrower. A good dual-threat athlete, the Sophomore also has a high football IQ and has led the Aggies to a 3-1 start in the Mountain West. As a freshman last year, he played in 12 games and started six, guiding Utah State to a 3-3 mark. He also established a freshman school-record for passing yards with 1,631. In back-to-back games, Love has produced over 25 fantasy points on 592 passing yards and five total touchdowns. Starting with a home contest against UNLV in mid-October, the Aggies schedule provides plenty of high-scoring games. The Twitterverse Responds.Time to hit the Waiver Wire in College Fantasy Football: Who are you targeting this week? The Ducks jumped out to a 17-point lead against Stanford at home and were two quarterback kneels away from winning the game. However, Oregon handed the ball to CJ Verdell, who fumbled when stripped by cornerback Noah Williams, and the Ducks lost the game in OT. Do not blame the redshirt freshman for the loss. He gained 115 rushing yards and scored a touchdown. Verdell never should have been in a situation to fumble. He has eclipsed the century mark in two of four games this year and scored twice. At 5-foot-9 and 201 pounds, he was a four-star prospect by ESPN in high school and has improved dramatically his second year on campus. In three of four games, he has paced the Ducks in carriers and leads the team with 59 attempts this season. Go grab Verdell. A Connecticut Yankee myself, it is nice to see a comrade succeed from the Nutmeg state. In high school, Marcus Outlow performed at Norwich Free Academy and played two seasons at Boston College before transferring to Coastal Carolina. A scholar in the classroom, he earned Dean’s List recognition both semesters last year and named to the Sun Belt Conference Commissioner’s List (3.50 or better GPA). Outlow dashes as well on the gridiron as he works in the classroom. At 5-foot-10 and 215 pounds, he has gained 358 yards rushing and scored five times on 66 attempts this season. In the next three games, the Chanticleers travel to Troy and UMass and host UL Monroe. Outlow can provide a much-needed backfield boost for CFF owners in need of assistance. I stayed up far too late on the East Coast to watch the entirety of the Stanford-Oregon contest on Saturday night. I could not go to bed in the middle of such an incredible game. And I was incredibly impressed by Dillon Mitchell. It appeared that every time quarterback Justin Herbert needed a big catch that he targeted Mitchell, who finished the evening with a 14-catch, 239- yard outing. It was by far his best performance of the crusade. Before Saturday, Mitchell only had six receptions for 98 yards and a touchdown. A 6-foot-1 and 195-pound junior, he led the team in receptions (42) and yards (517) last year, and named to the 2018 Preseason Athlon Sports All-Pac 12 second team. With Herbert seeking to cement his status as a first-round talent, Mitchell will see plenty of targets and opportunities to record catches and score fantasy points. Pluck the Dynamic Duck off the wire this week if you need assistance at wide out. Without question, Jonathan Duhart should be the hot commodity off the waiver wire this week. It is unfathomable that his ownership dropped from 40% to 38% last week. The Monarchs’ playmaker has scored double-digit points in every game this season and ranks fourth among CFF receivers. Duhart has snatched 26 passes for 502 yards and scored six touchdowns. Against Virginia Tech, he baffled the Hokies’ secondary with nine catches for 142 yards and three touchdowns in the Monarchs’ stunning upset victory. Playing in C-USA, the 6-foot-3, 210-pounder should be able to physically overpower opponents and continue to produce points on a weekly basis.